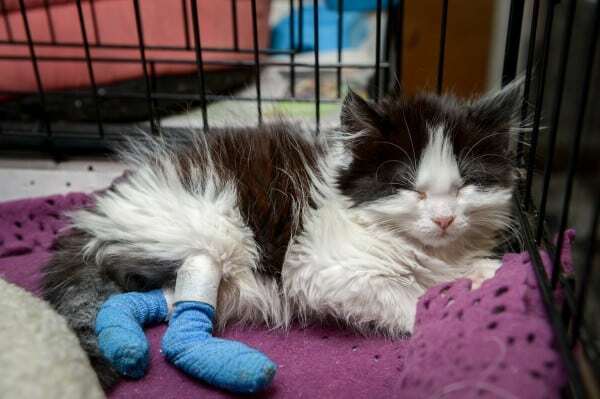 Animal cruelty: Who could hurt a kitten like this? Celia Hammond was horrified when she witnessed animal cruelty on a horrific level. You won’t believe what somebody did to these kittens. We helped Celia share her story to raise awareness. Celia, 73, thought she’d seen it all in her job as a vet. Until a mushy cardboard box arrived and showed the worst case of animal cruelty she’d ever witnessed. This is my perfect job, I thought to myself. I’d wanted to be a vet since I was a little girl – I’d always had animal jumpers, books about horses and I simply adored cats. There’s just something about cats that melt my heart – their intelligent eyes, their warm purr and their delicate paws. 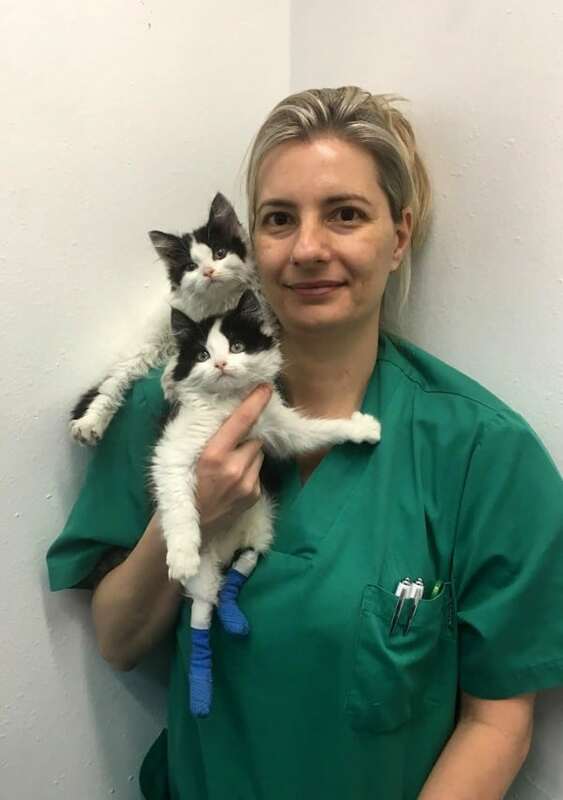 The kittens with vet Roberta Del Guardia. So you can imagine my horror when these tiny creatures get handed into me with matted fur and scared eyes after being abandoned by their owners. But today I was just drinking a good brew in my favourite cup with fluffy kittens on, and finishing off some much-needed paperwork. I sighed, some people think looking after cute animals is all fun and games…except when you have to fill in forms! Suddenly, I could hear my colleague Sara scream. Shocked, I split my tea all over my fingers but I couldn’t feel them burning – I was more worried about what had made her scream. Tentatively peering over my computer, I looked to see what the fuss was about. I saw a cardboard box on the reception counter – it was moving. My heart was beating so fast as I rushed over and opened up the soggy, mushy box – it had some gashes in that I guessed were air holes. I looked inside to see two gorgeous little black and white kittens – barely a few weeks old with the most beautiful, saucer-like eyes. Except they were mewing sadly, as if they had no voices left. The inside of the box was covered in blood, my vision blurred with tears and I started to feel queasy. 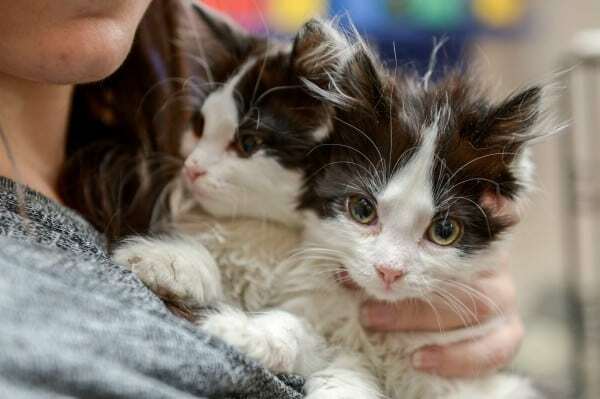 There were two tomcats but one of them was missing his paws – they had been hacked off. The brothers who were dumped in a cardboard box. What animal would have done this to such a tiny, poor creature? It got worse, the other kitty had a crooked broken back from where it looked like someone had brutally stood him. As I picked up the paw-less cat to inspect the bottom of the box, I felt bile rise to my throat. His tail had been sliced off. The room started spinning. I quickly put him down before I held onto the desk to steady myself. I had to get a grip, this was my job and I needed to help these poor kitties. Wiping the tears from my eyes I remembered that this was the reason why I’d worked hard my whole life – it was to help animals who needed me. Looking back into the box, I noticed that it was stained with urine, faeces, clumps of matted fur and even bits of bone from their hacked claws. I could see their ribs from how malnourished they were, and even what fur was left on them was swarming with fleas. Incredibly, the kittens started purring – they were desperate for affection. Luke the kitten having his bandages changed by a member of staff. First things first, they didn’t even have names! They needed to be something that represented bravery and never giving up – like a hero. It clicked – I’m going to name one Luke, and the other Skywalker. The hero from Star Wars that never gave up! Little Luke couldn’t even stand on the surgical table as the bottom of his feet had been sliced off – leaving him without any toes or pads to walk on. The end of his tail had to be amputated and his frail body was covered in seeping sores. Skywalker could hardly walk either as his back was broken in several places – his spinal injury was so bad, I didn’t know if he would make the night. Even when I prodded them with needles and put them under x-ray machines – they were constantly purring. They loved being held next to my warm neck and stroked with my fingertips – as if they’d never known human affection. Luke has been made customised socks to help him recover. But instead of thinking of the cruel thugs that did this to these poor brothers and the horrific animal cruelty, I focused on making sure they got back on their feet. I wrapped up Luke’s paws over and over as his brittle bones kept poking through the dressings, before eventually sending him into reconstructive surgery. For Skywalker, unfortunately, an MRI scan in intensive care showed that he had developed a cyst within the membrane covering his spinal cord. While he’s now on the road to recovery, he will still need major spinal surgery in order for his back to be straight and fully mobile. 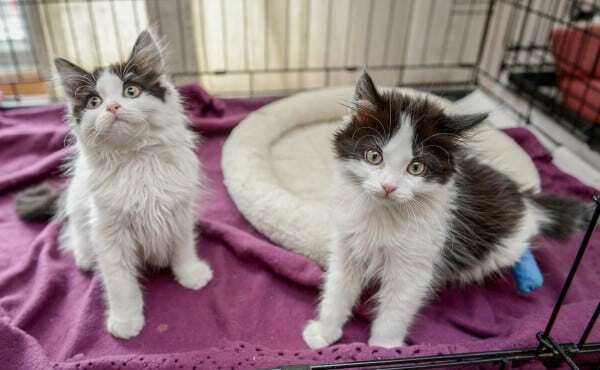 There would be a long way to go before these kitty-cats are put up for adoption to be taken in by a loving family. But still, they were exceptionally cheeky and I had to keep stopping them from hopping around and playing like ordinary kittens! The tiny kittens are recovering together. When I eventually got home, I couldn’t sleep – I could barely close my eyes without seeing the images of their slashed paws and sawn-off tail. It’s hard to believe that someone could do something like this to our tiny, furry friends, and expose them to animal cruelty on a sickening scale. I was relieved that I was there – to save their lives, and do my job. 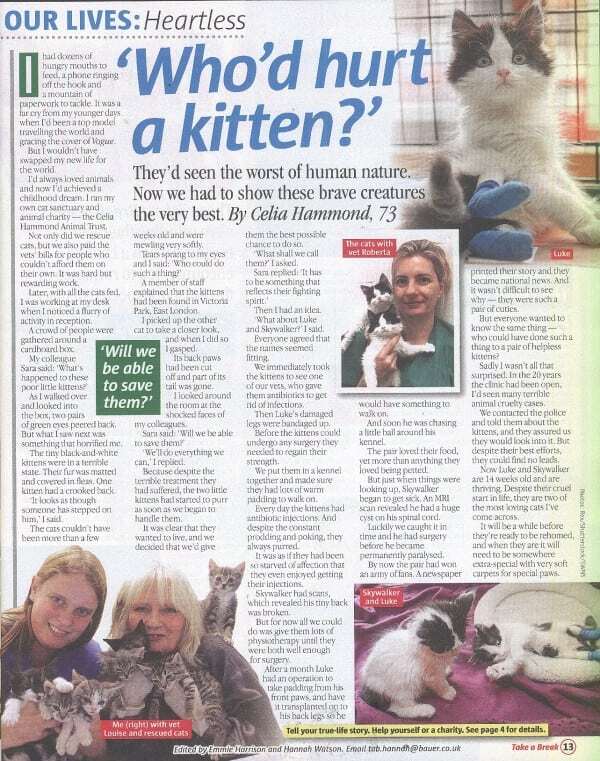 To donate to the Celia Hammond Trust and fight against animal cruelty, visit http://campaign.justgiving.com/charity/celiahammond/lukeskywalker. We helped Celia sell her animal cruelty story exclusively to Take a Break Magazine, who outbid rival magazines for the rights to print Celia’s story. We publish all types of real life stories. If you would like us to auction your story to the highest bidding magazine, get in touch using the story valuation form on this page. For more information you can read our Sell My Story page, which explains the process of selling your story in more detail, or you can contact us here.